Isabel – during one of her steamings – at Ongar. Following arrival on the line on March 27 2012, she needed a fair bit of attention to get her working again. Unfortunately, in August that same year, she had to be withdrawn from service, having several faults and in need of a re-tube. Despite having roughly 3 years left of her boiler ticket, it was decided to fully overhaul her and bring her back with a full 10-year certificate. The overhaul was commenced during the Spring of 2014. 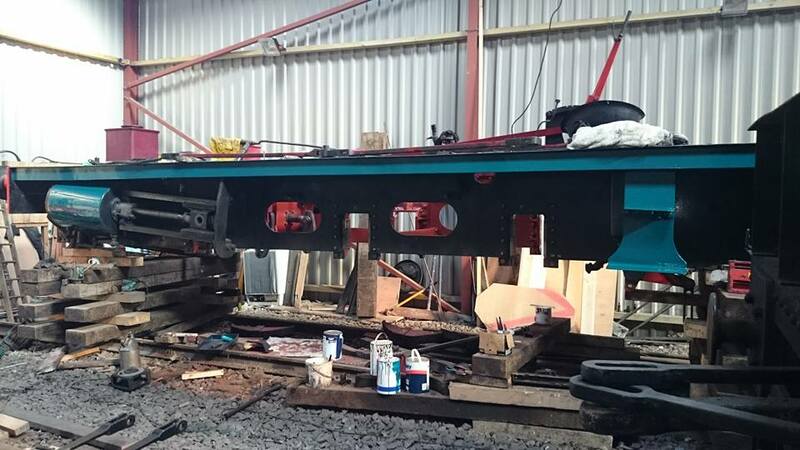 The cab and saddle tank were removed and rubbed down, before attention turned to the rest of the loco, which resides at the back of North Weald shed. 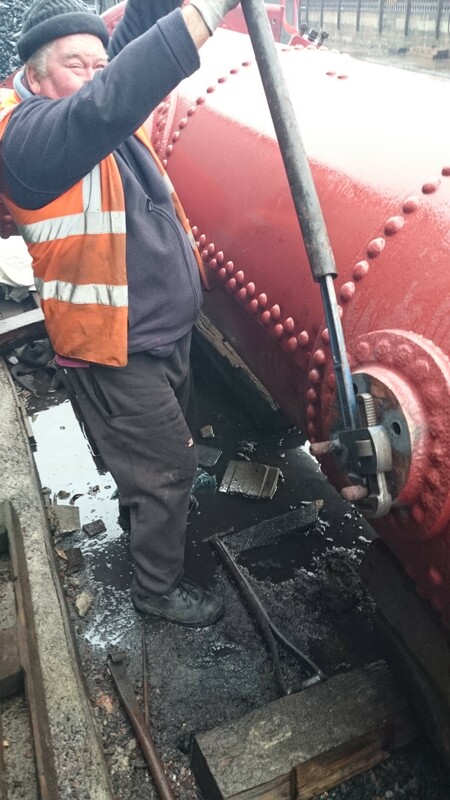 The boiler was lifted that May, and cleaned in preparation for an inspection to asses the work required. 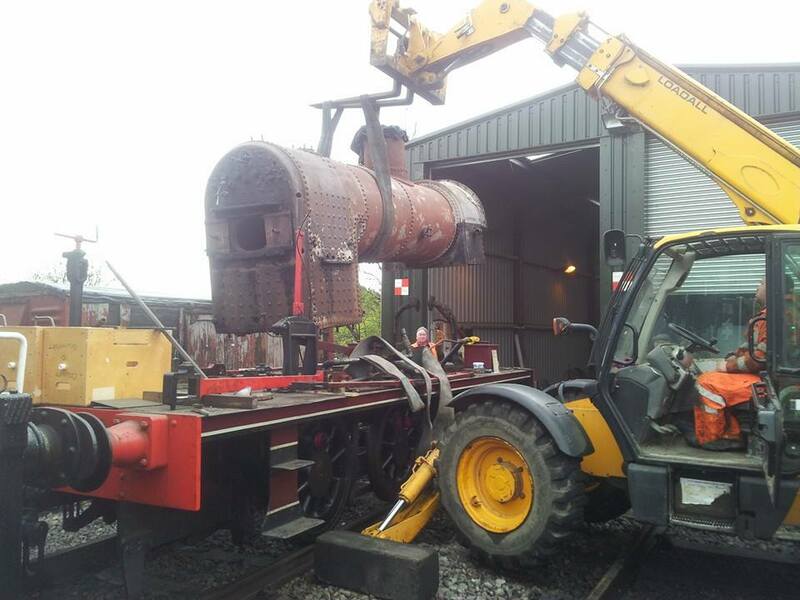 The boiler is lifted from the frames, allowing work to progress on Isabel’s overhaul. The axle boxes were stripped down; a lot of side play was found, far in excess of what is the norm, together with the hornguides, which they sit inside. These are also worn, and will be removed from the frames to receive a little machining, which will make them square and true again. This will be done in-house, using the machinery fitted in the Machine Shop. During the summer of 2014, the brake rigging crossbeams were straightened, using a new 50 ton press. New buckles were also fitted to the extension arms that run from each crossbeam, to rectify years of wear which have resulted in oval holes. 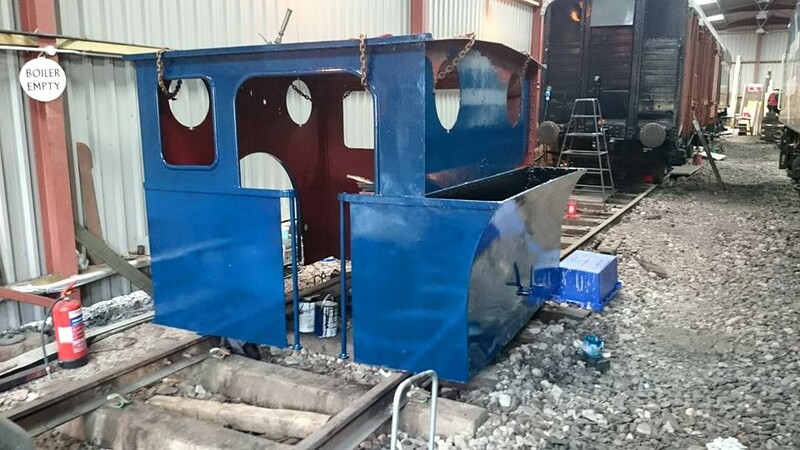 The saddle tank and cab were further rubbed down, and given a primer coat of paint by the mid-week volunteers. the fusible plug area on the firebox crown sheet. The backhead radius (shoulders) were to be checked for cracking by Non-Destructive Testing (NDT) ultrasonic testing. This was to be carried out by a specialist contractor; if there was anything found that could be a problem, additional repairs would be needed. 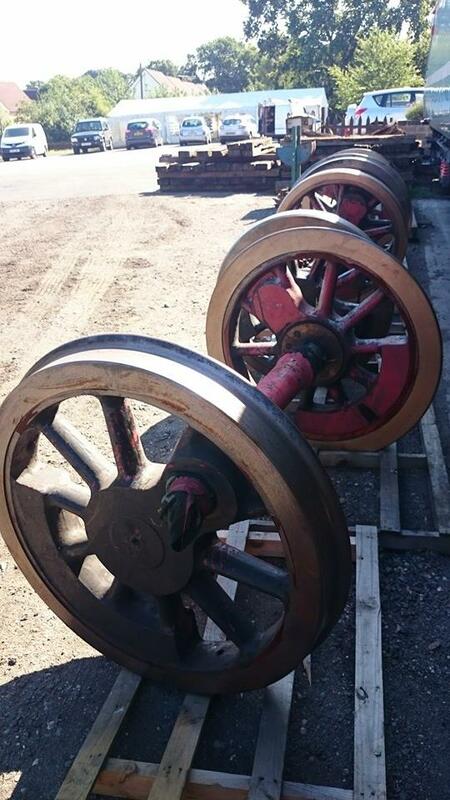 A new set of tyres were sourced and purchased, with the axles being sent off to Riley and Sons for them to be fitted. They were then machined to the correct profile, and returned in July 2015. 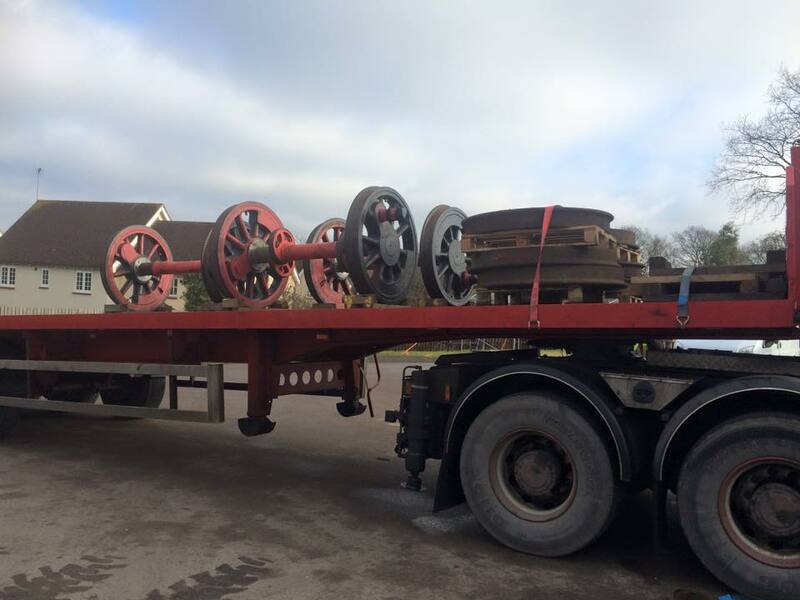 The driving axles are sent away for fresh tyres to be fitted. While the wheelsets were away, the boiler received all-new crown stay nuts, which were machined up in-house. Wastage washers were fitted to the crown of the firebox. 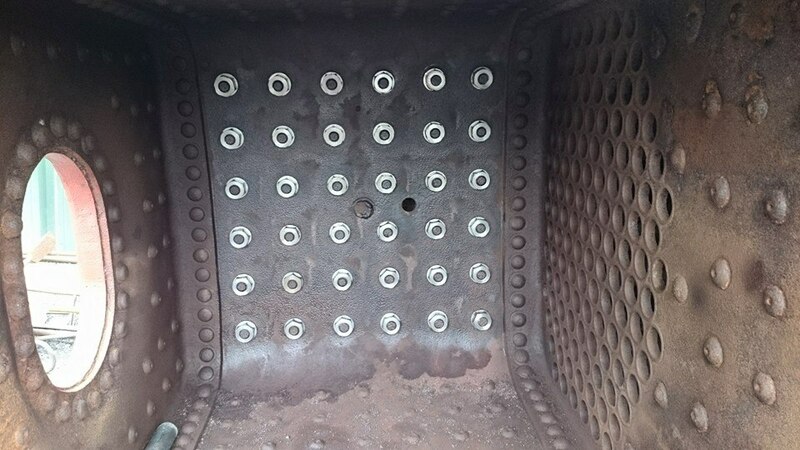 All the old studs that hold all the boiler fittings – from injectors clacks to the firebox door assembly and ashpan – have now been removed from the boiler and replaced with fresh ones. The boiler is laid to rest on its side, allowing access to the firebox. The late Richard Goulding removes the safety valve studs. New crownstay nuts and washers into the firebox crown. The cab, following a coating of red oxide. All manner of other work, including inspections of the pistons and descaling of the frames, has also taken place. The boiler has since been sent away to Norfolk for the new tubes to fitted (amongst other jobs), whilst the on-site volunteers continue to work on the frames. 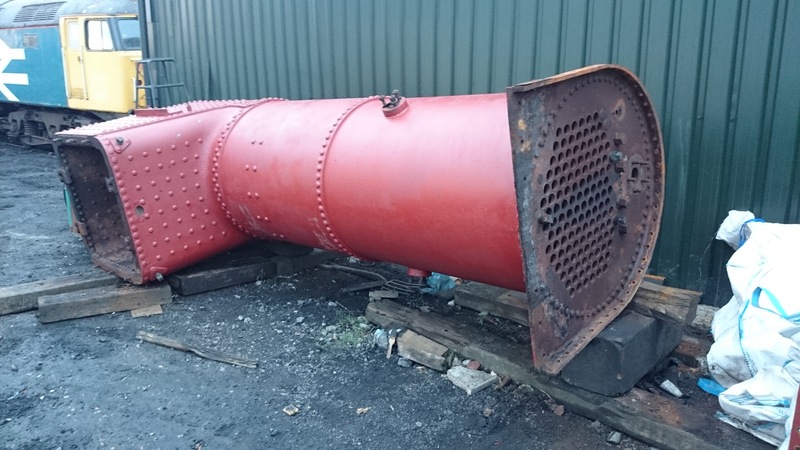 It is hoped the boiler will be completed for October, after which a few finishing touches to it can be made, before testing begins. The boiler cladding, tanks, cabs and frames have now mostly received an initial coat of blue paint. As the engine is slowly reassembled, this will be finished off and lined out, though what scheme exactly is yet to be decided. The frames also receive some attention. The cab receives its first base coat of blue. The returned wheelsets, with thick, new tyres fitted and machined. 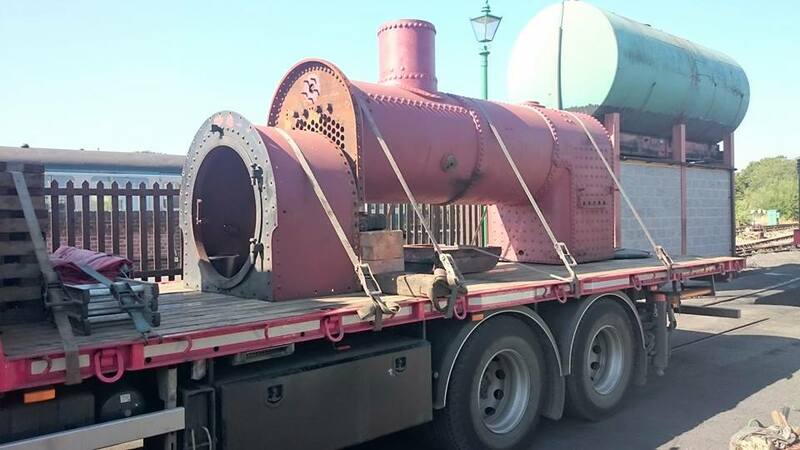 The boiler has now been sent away to Norfolk for some of the work required, which will speed up the overhaul. Overhauling a small loco such as ‘Isabel’ is a great way to learn the workings of a steam engine – and is particularly suited to younger volunteers, and those who would like to progress through the ranks of an engineman. 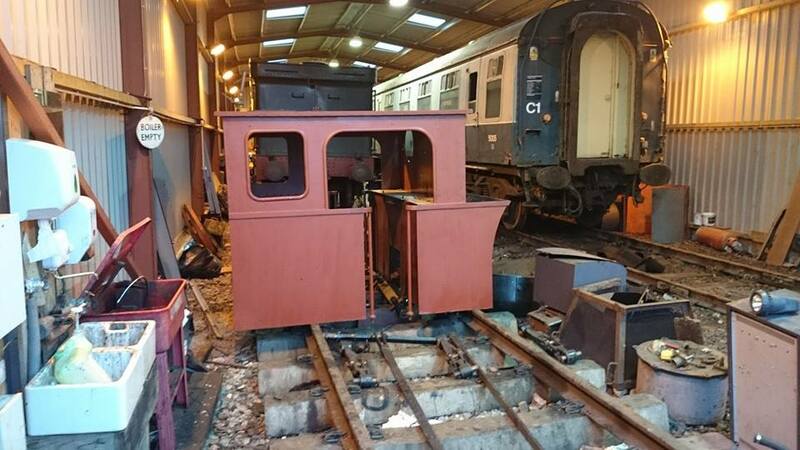 There’s still much work needing to be completed before we will see our little industrial back in action on light services and brake van rides – if you’d like to get involved, you’d be more than welcome. You don’t have to have any skills; just be prepared to ask questions, learn as you go and, most importantly, don’t be afraid to get your hands dirty!